But... those are Cheschire-Kaat's FlashLight kids! 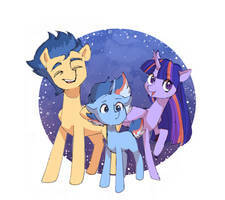 Indeed, dear watchers, glaze upon Prism Shield and Shooting Star, the son and daughter of Princess Twilight Sparkle and her husband, Prince (and Captain) Flash Sentry. Shooting Star loves her big brother very much, even if he can be a grumpy cat sometimes. The feeling is mutual, and Prism adores her. Headcannon: Shooting Star is the only wingless pony of her (immediate) family. Thus, Prism often gives her a ride and take her flying. I need to draw those two more. how is your part of the art trade is doing?